Beatrice "Bice" di Folco Portinari (pronounced Italian: [be.aˈtriːtʃe], 1266–1290) was a Florentine woman who has been commonly identified as the principal inspiration for Dante Alighieri's Vita Nuova, and is also commonly identified with the Beatrice who appears as one of his guides in the Divine Comedy (La Divina Commedia) in the last book, Paradiso, and in the last four cantos of Purgatorio. There she takes over as guide from the Latin poet Virgil because, as a pagan, Virgil cannot enter Paradise and because, being the incarnation of beatific love, as her name implies, it is Beatrice who leads into the Beatific vision. Scholars have long debated whether the historical Beatrice is intended to be identified with either or both of the Beatrices in Dante's writings. She was apparently the daughter of the banker Folco Portinari, and was married to another banker, Simone dei Bardi. 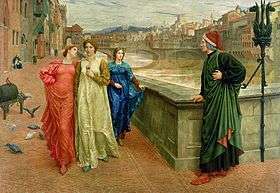 Dante claims to have met a "Beatrice" only twice, on occasions separated by nine years, but was so affected by the meetings that he carried his love for her throughout his life. The tradition that identifies Bice di Folco Portinari as the Beatrice loved by Dante is now widely, though not unanimously, accepted by scholars. Boccaccio, in his commentary on the Divine Comedy, was the first one to explicitly refer to the young woman; all later references are dependent on his unsubstantiated identification. Clear documents on her life have always been scarce, helping to make even her existence doubtful. The only hard evidence is the will of Folco Portinari from 1287 which says " ..item d. Bici filie sue et uxoris d. Simonis del Bardis reliquite ..., lib.50 ad floren"—essentially a bequest to his daughter who was married to Simone dei Bardi. Folco Portinari was a rich banker, born in Portico di Romagna. He moved to Florence and lived in a house near Dante where he had six daughters. Folco also gave generously to found the hospital of Santa Maria Nuova. "Dante and Beatrice" redirects here. For the painting by Henry Holiday, see Dante and Beatrice (painting). According to Dante, he first met Beatrice when his father took him to the Portinari house for a May Day party. At the time, Beatrice was eight years old, a year younger than Dante. Dante was instantly taken with her and remained so throughout her life even though she married another man, banker Simone dei Bardi, in 1287. Beatrice died three years after the marriage in June 1290 at the age of 24. Dante continued to hold an abiding love and respect for the woman after her death, even after he married Gemma Donati in 1285 and had children. After Beatrice's death, Dante withdrew into intense study and began composing poems dedicated to her memory. The collection of these poems, along with others he had previously written in his journal in awe of Beatrice, became La Vita Nuova. According to the autobiographic La Vita Nuova, Beatrice and Dante met only twice during their lives. Even less credible is the numerology behind these encounters, marking out Dante's life in periods of nine years. This amount of time falls in line with Dante's repeated use of the number three or multiples of, derived from the Holy Trinity. It is more likely that the encounters with Beatrice that Dante writes of are the two that fulfill his poetic vision, and Beatrice, like Petrarch's Laura, seem to blur the line between an actual love interest and a means employed by the poet in his creations. Following their first meeting, Dante was so enthralled by Beatrice that he later wrote in La Vita Nuova: Ecce Deus fortior me, qui veniens dominabitur michi ("Behold, a deity stronger than I; who coming, shall rule over me.") Indeed, Dante frequented parts of Florence, his home city, where he thought he might catch even a glimpse of her. As he did so, he made great efforts to ensure his thoughts of Beatrice remained private, even writing poetry for another lady, so as to use her as a "screen for the truth". Dante's courtly love for Beatrice continued for nine years, before the pair finally met again. This meeting occurred in a street of Florence, which she walked along dressed in white and accompanied by two older women. She turned and greeted him, her salutation filling him with such joy that he retreated to his room to think about her. In doing so, he fell asleep, and had a dream which would become the subject of the first sonnet in La Vita Nuova. And betaking me to the loneliness of mine own room, I fell to thinking of this most courteous lady, thinking of whom I was overtaken by a pleasant slumber, wherein a marvelous vision was presented to me: for there appeared to be in my room a mist of the colour of fire, within the which I discerned the figure of a Lord of terrible aspect to such as should gaze upon him, but who seemed there-withal to rejoice inwardly that it was a marvel to see. Speaking he said many things, among the which I could understand but few; and of these, this: "I am thy Lord". In his arms it seemed to me that a person was sleeping, covered only with a crimson cloth; upon whom looking very attentively, I knew that it was the Lady of the Salutation, who had deigned the day before to salute me. And he who held her held also in his hand a thing that was burning in flames, and he said to me "Behold thy heart". But when he had remained with me a little while, I thought that he set himself to awaken her that slept; after the which he made her to eat that thing which flamed in his hand; and she ate as one fearing. This was the last encounter between the pair, since Beatrice died eight years later at the age of twenty-four in 1290. 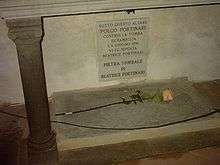 Tomb of Beatrice in Santa Margherita de' Cerchi. She has ineffable courtesy, is my beatitude, the destroyer of all vices and the queen of virtue, salvation. Dante saw Beatrice as a saviour, one who removed all evil intentions from him. It is perhaps this idea of her being a force for good that he fell in love with, a force which he believed made him a better person. This is certainly viable, since he does not seem concerned with her appearance—at least not in his writings. He only once describes her complexion, and her "emerald" eyes. 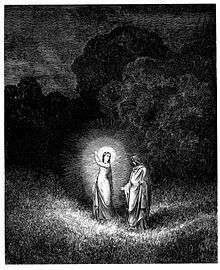 Beatrice appears to Virgil at the start of Inferno, in an illustration by Gustave Doré. Beatrice's influence was far from simple inspiration. She appeared as a character in his two greatest works—La Vita Nuova and Divine Comedy. She first appeared in La Vita Nuova, which Dante wrote in about 1293. The book was filled with poems about Beatrice, and entirely complimentary to her; she was described as "gentilissima" and "benedetta" (meaning "most kind" and "blessed" respectively). Although they converse in personal terms, this is no more than the imagination of Dante. Since their relationship had no contact, the Beatrice of his works was shaped entirely by his own mind. He once called her "La gloriosa donna della mia mente", which means "the glorious lady of my mind". Beatrice Portinari has been immortalized not only in Dante's poems but in paintings by Pre-Raphaelite masters and poets in the nineteenth century. 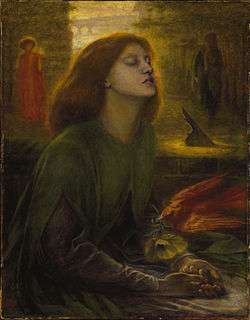 Subjects taken from Dante Alighieri's La Vita Nuova (which Rossetti had translated into English) and mostly the idealisation of Beatrice Portinari had inspired a great deal of Dante Gabriel Rossetti's art in the 1850s, in particular after the death of his wife Elizabeth Siddal. He idealised her image as Dante's Beatrice in a number of paintings, such as "Beata Beatrix". Beatrice has also been immortalised in space, as asteroid 83 Beatrix is named in her honour. The Dante Alighieri Academy Beatrice Campus, a Catholic high school in Toronto, Ontario, Canada is named after Portinari. In A Series of Unfortunate Events by Daniel Handler, Snicket's love interest is named Beatrice, after Portinari. The relationship between the characters is very similar to that of Beatrice and Dante. In the animated miniseries, Over the Garden Wall, the woods called the Unknown is implied multiple times throughout the series to be some form of afterlife. Here, the main characters Wirt and Greg are guided through the Unknown by a bluebird named Beatrice. ↑ "Dante Alighieri on the Web". Greatdante.net. Retrieved 2013-09-04. ↑ , Dante Alighieri, "La Vita Nuova," as translated by Dante Gabriel Rossetti via The Project Gutenberg ebook. Conway, James. "Beatrice and Other Allegorical Characters of Dante Alighieri," The American Catholic Quarterly Review, Vol. XVII, 1892. Frisardi, Andrew. The Young Dante and the One Love: Two Lectures on the Vita Nova. Temenos Academy, 2013. ISBN 978-0-9564078-8-7.